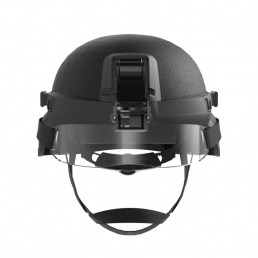 Pacific Safety Products Inc. asked us to design and develop an innovative combat helmet. The goal was to develop a system that allowed the end user to optionally remove the heavy outer, ACH, shell during operations that required less protection. The ACH shell had to be quickly and easily removable and allow for standard night vision mounts. In addition, the helmet had to incorporate standard accessory rails that could be attached to either helmet.